Huawei's push into the US market has by no means stopped, even despite the recent US government pushback. Huawei has already released their top-notch flagship device from 2017, the Mate 10 Pro, and a couple great budget and midrange devices. Their latest release offers an upgrade to a past release. Earlier in the year, Huawei released the Honor 7X, a great entry-level device that provided an 18:9 display and great battery life for a price where most OEMs make many compromises. With the Huawei Mate SE, almost the entire 7X spec sheet is retained, but with two changes and a slight price increase. While its redundancy is alarming, for those penny-pinching, this device offers worthwhile value for a little bit more than the Honor 7X. Dimensions: 6.16" x 2.96" x 0.30"
Like the Honor 7X, the Huawei Mate SE provides customers an 18:9 5.93" 2160 x 1080 LCD display. The quality of this display is unheard of at its price (more on that later), providing an edge-to-edge viewing experience that only recently appeared on flagship smartphones the year before. 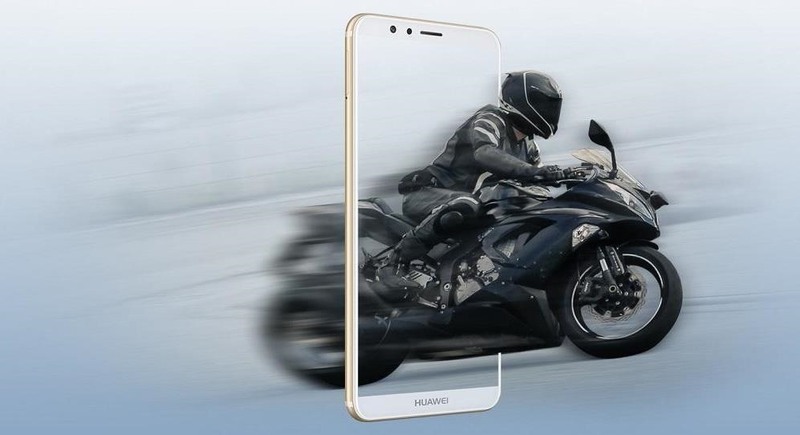 Additionally, Huawei didn't compromise on the resolution, providing customers the sweet spot of 1080p, a resolution which balances battery life without compromising the media consumption experience. 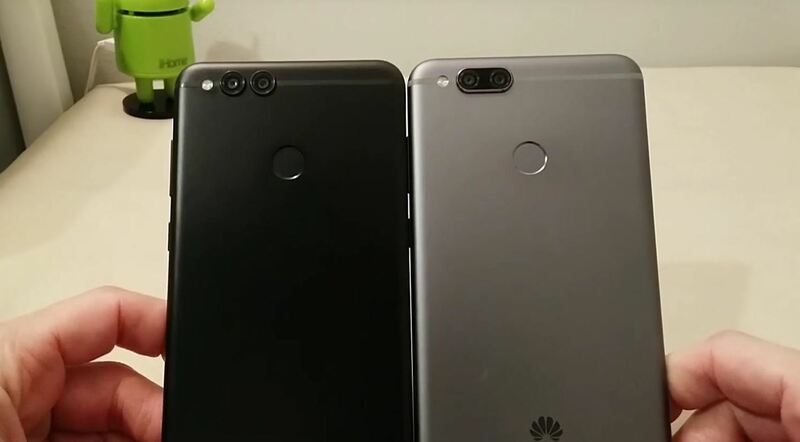 The Huawei Mate SE uses the same dual camera system from the Honor 7X. It has a 16 MP RGB sensor as the main shooter and a 2 MP monochrome sensor which helps provide detail and clarity. While you can't shoot in black and white with the monochrome sensor directly, its inclusion does improve photography, as it captures detail not possible with one camera. The only difference between the Mate SE and the Honor 7X is the addition of more RAM and more storage. RAM is increased by one to 4 GB, putting it on par with most flagship devices, while the storage is doubled. While this may seem like a small change, it does affect overall performance, as more RAM means fewer apps needing to refresh when left in the background. Additionally, more storage means more apps, music, and videos that you can capture and enjoy on your device. The Huawei Mate SE makes no sacrifice with respect to the Honor 7X and retains both the headphone jack and its IP67 rating. Despite many phones dropping the input, the Mate SE will allow you to enjoy your music using either Bluetooth or wired headphones, not just the former. 6: The first digit signifies the rating for protection against dust, dirt, and other foreign debris. The highest number is a 6, indicating the Huawei Mate SE is "dustproof." 7: The second digit is the water resistance rating. Using a scale from 1-8, a "7" equates to the Mate SE being able to be fully submerged in water as deep as 1 meter for a period of up to 30 minutes. Finally, the same 3,340 mAh battery is included that, when paired with the Kirin 659, should translate into all day (and more) battery life. 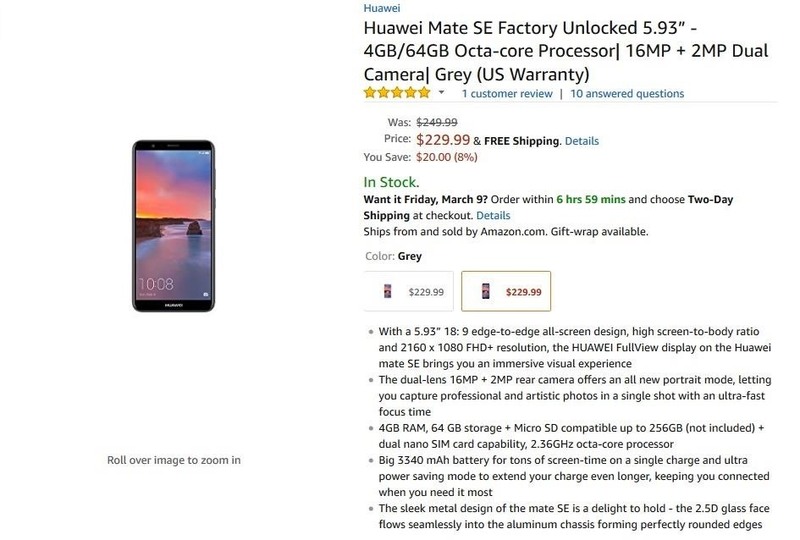 The Huawei Mate SE is currently on several e-commerce websites for $229. There are currently two colors available: Grey and Gold. Similar to the Honor 7X, Huawei is selling this device GSM Unlocked, meaning it will only work on T-Mobile & AT&T networks. The Huawei Mate SE provides something many budget-conscious users don't normally have: Choice. Specifically, the choice to purchase a plus version of (virtually) the same device for a few more dollars. At $229.99, customers can decide whether to save $30 for less RAM and storage with the Honor 7X or pay a little more for a smoother experience. What do you think of the Huawei Mate SE? Let us know in the comments below.